Rihanna continues to make history more than a decade into her career. She covers the September 2018 issue of British Vogue making her the first black woman to cover a September issue in the 102 year history of the British magazine. 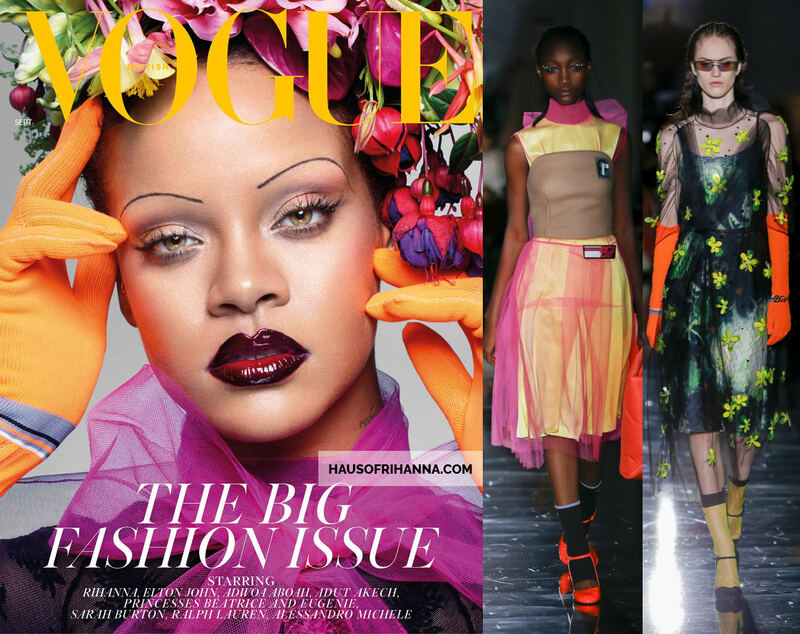 Anyone who’s into fashion will tell you that the September issue is the most important of the year and to have Rihanna be the first black woman is momentous. Editor-in-chief Edward Enninful styled Rihanna for the shoot while Nick Knight did the photography. Yusef Williams worked on hair, Isamaya French did the makeup using Fenty Beauty products and Jenny Longworth did nails. 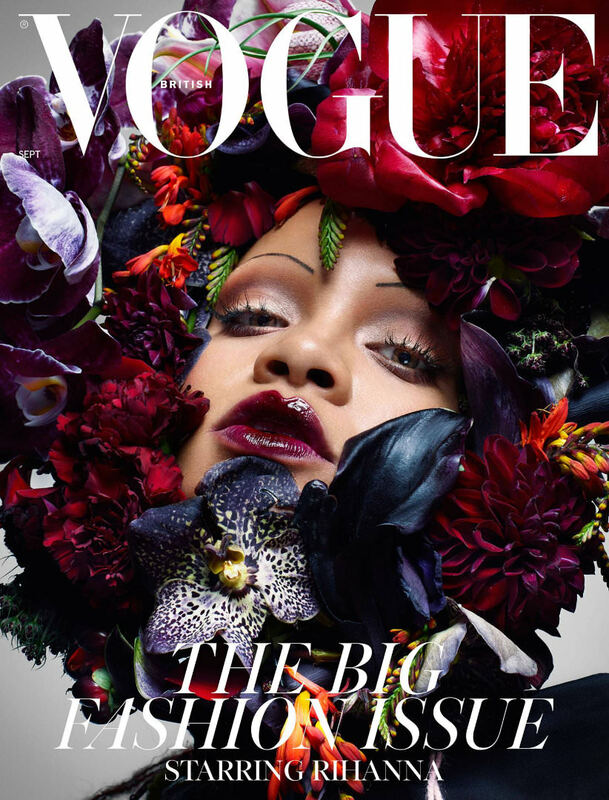 Japanese flower artist Azuma Makoto created the incredible floral headpieces Rihanna wears throughout the shoot. On the main cover the Barbadian superstar rocks a pink tulle dress and orange knit gloves from Prada‘s Fall/Winter 2018 collection. Throughout the editorial Rihanna wears a custom black lace bodysuit by her own lingerie line Savage x Fenty. Pictured above is a similar floral stretch lace body that is currently available on their website for $69. 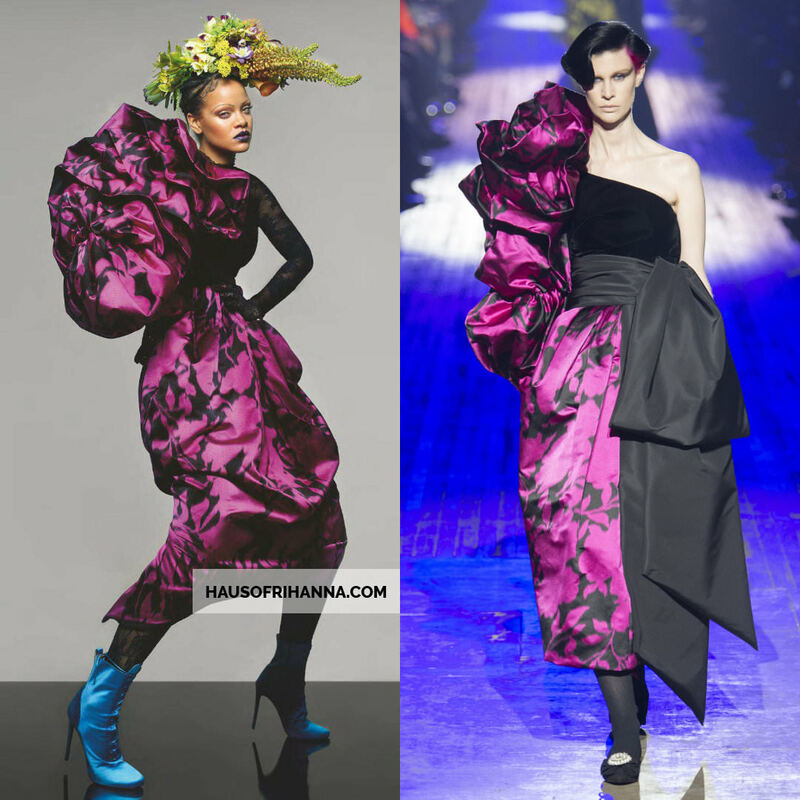 Please note that Rihanna’s version has a higher neckline with lace trim and it does not have the cuffs. 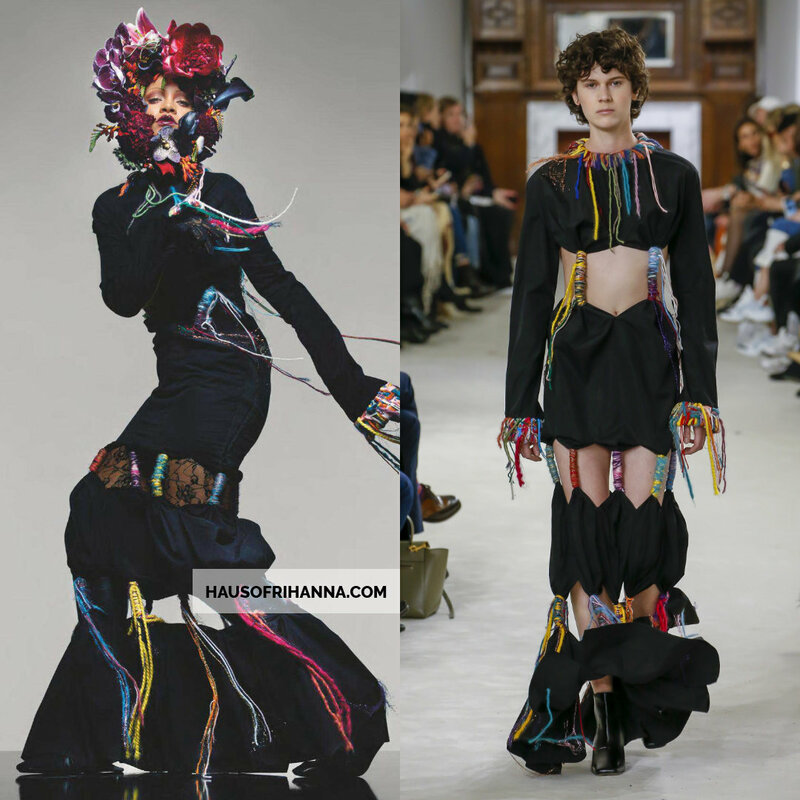 On the subscribers’ cover and in this photo Rihanna dons a Loewe Fall/Winter 2018 gown that features long sleeves and different tiers connected by multicolored yarn. 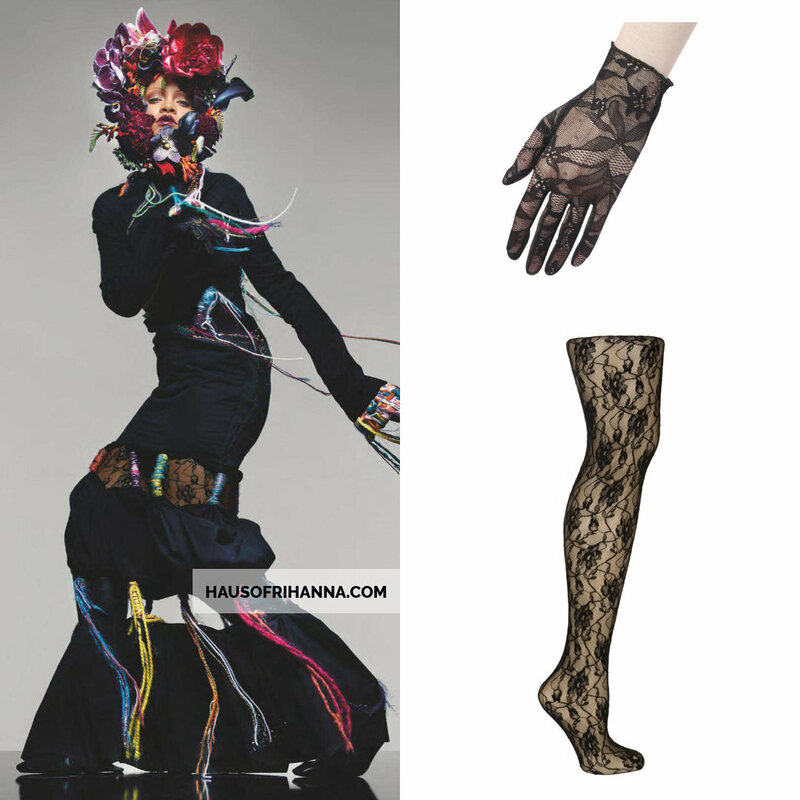 In several photos including this one Rihanna sports a pair of Cornelia James‘ Virginia lace gloves in black ($91). These are wrist-length and feature an art deco design. And throughout the shoot she wears a pair of Jonathan Aston‘s Sweet Roses lace tights ($21.27). Here the business mogul rocks a wool and silk tuxedo jacket with draped pink silk from Alexander McQueen‘s Fall/Winter 2018 collection [Look 38]. The gloves and tights are the same as mentioned earlier. Next we have Rihanna in a pink and black asymmetric silk and velvet dress from Marc Jacobs‘ Fall/Winter 2018 collection [Look 44]. The bodysuit, gloves and tights are the same as before. 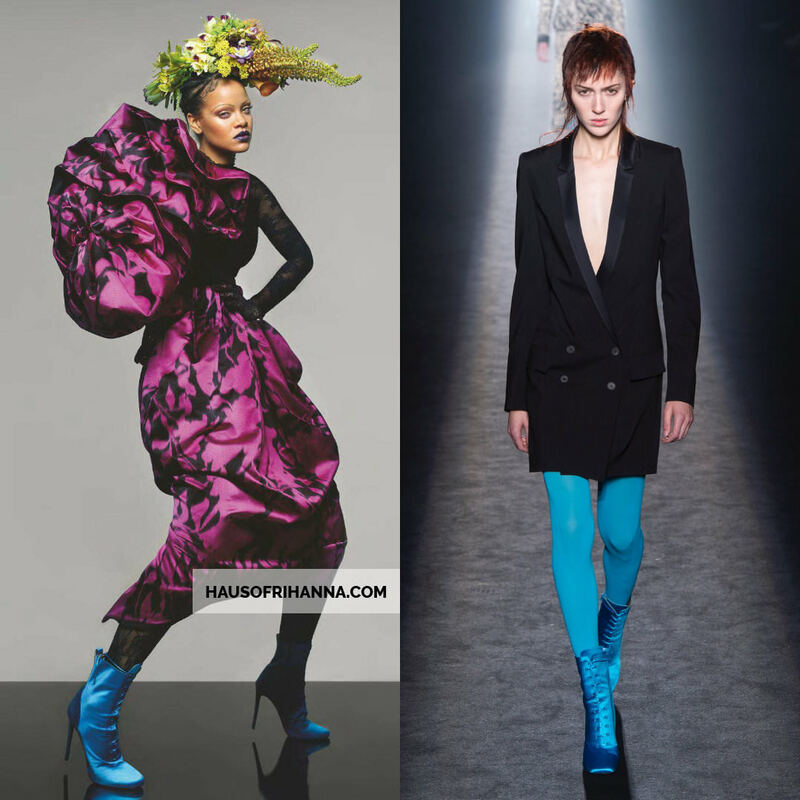 She also wears a pair of Fall 2018 blue lace-up boots by Haider Ackermann. 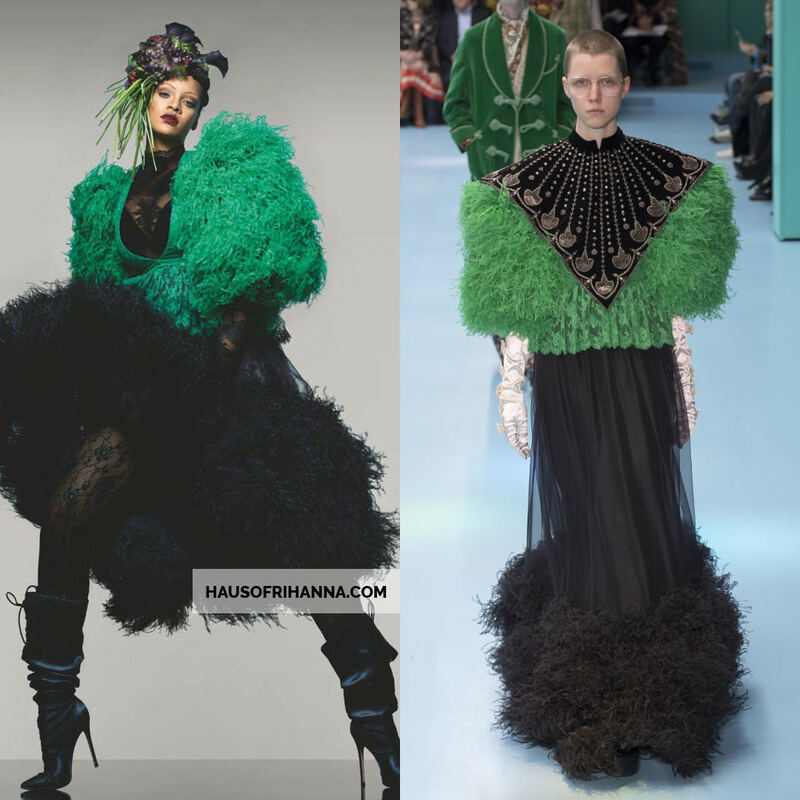 Above Rihanna poses in a Gucci Fall 2018 silk and lace v-neck gown embroidered with green and black feathers. She completes the look with a pair of Gianvito Rossi‘s Amanda satin lace-up boots ($1,795) as well as the bodysuit and tights mentioned earlier. 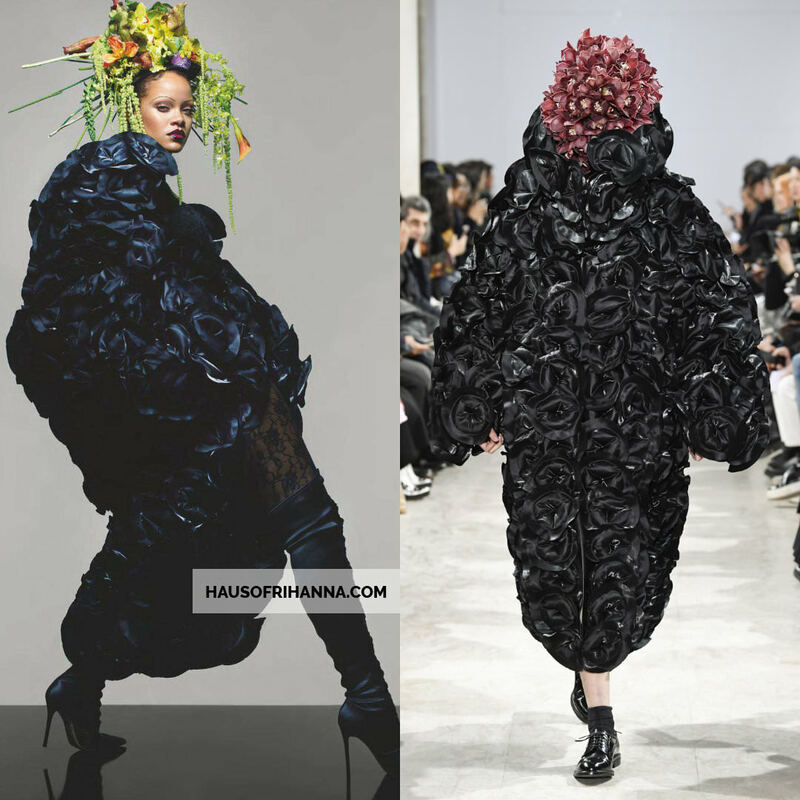 In this penultimate shot Rihanna dons a black floral coat from Noir Kei Ninomiya‘s Fall/Winter 2018 collection [Look 36]. Again she wears Gianvito Rossi‘s Amanda satin boots ($1,795) and the Jonathan Aston Sweet Roses lace tights ($21.27). Finally, we have the stunning beauty in a draped wool bustier dress by Saint Laurent from the Fall/Winter 2018 collection [Look 55]. The bodysuit, gloves and tights are the same as before. The ruby and emerald earrings are by Bina Goenka and the 18k gold cuffs are by Van Cleef & Arpels. 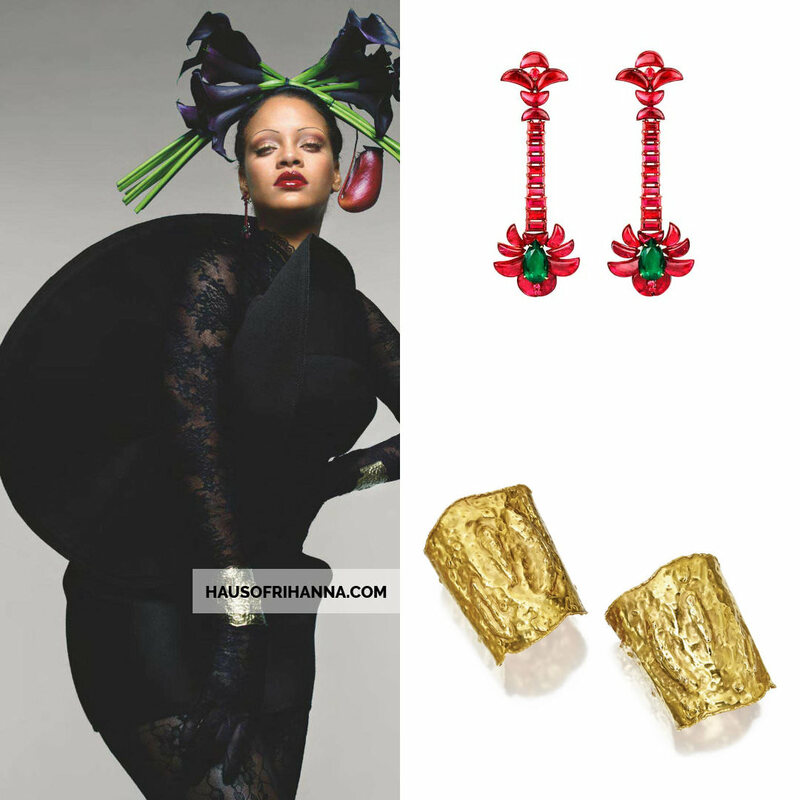 These are called the Manchette cuffs and Rih wore a pair in her March 2015 shoot for Harper’s Bazaar.